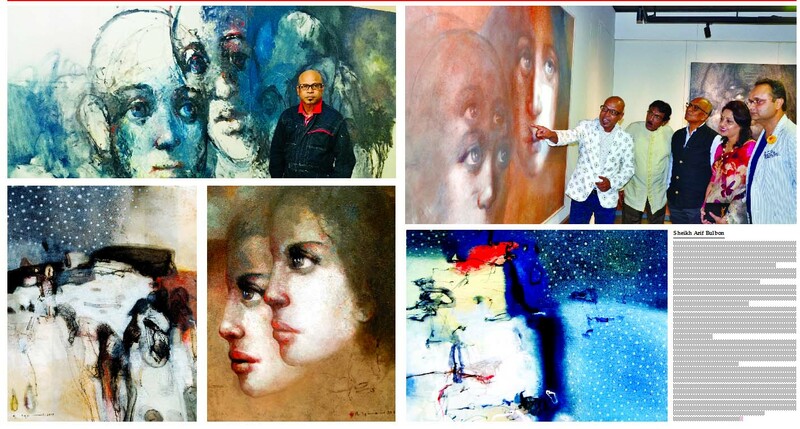 Edge, the Foundation has organised a solo contemporary art exhibition titled ‘Silent Revelations’ by artist Mohammad Iqbal at The Courtyard at Park Heights in the city's Dhanmondi area. The exhibition is featuring a number of 50 artworks of renowned Bangladeshi contemporary artist Mohammad Iqbal. Mohammad Iqbal is an Associate Professor in Drawing and Painting Department, Faculty of Fine Arts, University of Dhaka and involved in curatorial activities as well. The ‘Silent Revelations’ series is jointly exhibited at both Edge Gallery, Gulshan and The Courtyard at Park Heights, Dhanmondi. Both galleries will remain open to all every day from 10:00am to 8:00pm, until May 5. Born in 1967, Mohammad Iqbal is a prominent contemporary artist based in Dhaka and Tokyo. He holds BFA and MFA degree in Drawing and Painting from Faculty of Fine Arts, University of Dhaka. He got Japan Govt Scholarship in Japan and went there for his MFA and PhD degree in Oil Painting from Tokyo University of Arts. He received numerous awards from home and abroad such as Atish Diponkor Gold Medal in Fine Arts (2015), Nomura Grand Award(2010), Aoki Shigeru Grand Prize (2005), City Mayor Award (2005) National & young Artists Award, Bangladesh Shilpakala Academy and so on. He has exhibited in many international and national group exhibitions. His solo exhibition number is 42 in home and abroad. Collection: National Art Gallery, National Museum, Prime Minister office, Ministry of Foreign Affairs, Bangladesh; Contemporary Art and Cultural Center Osaka, Bridge Stone Art Museum, Tokyo, University Art Museum of Tokyo University of the Arts, Prime Minister of Japan (Shinz? Abe) National Academy of Art, New Delhi, India; ; and many Institutional and many private collections at home and abroad.